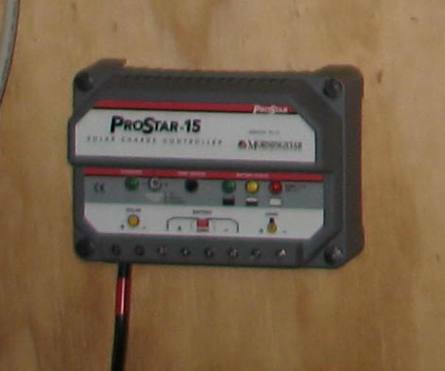 This is the 15 amp Prostar charge controller that I will be using for the Photovoltaic Panels on my roof. This unit consists of a pos. and neg. 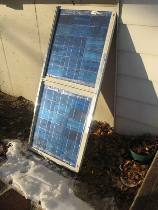 solar connection, battery sense connections, normal battery connections, a load connection(optional), battery type selection, a 15amp rating. This controller is required by the NEC to control my pv panels, because the other Morningstar ts-60 is just configured in a "Diversion Load" setting. This controller will actually charge the batteries like I didn't have other alternative energy devices on my system. This statement is also in the Morninstar ts-60 user manual. As you can see on the charge controller above there is also a connection for the neg. and pos. outputs for a load. This is to connect a DC Load to your PV panels/Batteries , this connection is optional and in our case not going to be used.